CorelDRAW Graphics Suite is doing its best to assist you in graphics editing with a straight-forward layout and powerful functions. With improved features such as page layout and vector illustration, the collection aims to win over Adobe fans, but isn’t just there yet. CorelDRAW Graphics Suite is an all-improved graphic editor that you can use to design and create compelling logos, ads and websites; it is aimed at professional designers and artists and is one of the most appreciated vector graphics and image editing applications. CorelDraw allows you to explore your creativity and to express the artist in you in an intuitive and comfortable environment. The classic, menu-shaped interface provides users with functions that facilitate photo editing, web graphics design and the creation of rich and unique content. Get the power and stability you need with full support for Microsoft Windows 10 and discover how its innovative features can augment your graphic design experience, plus enjoy existing support for Windows 10. 8.1, and 7. Expand your compatibility options with the latest file formats, including AI, PSD, PDF, JPG, PNG, SVG, DWG, DXF, EPS, TIFF, DOCX, PPT and more. Take advantage of the new multi-monitor viewing and 4K displays support. Work quickly and efficiently with the added control from the Windows Real-Time Stylus pen-compatible tablets, such as the Microsoft Surface, in addition to the Wacom tablet and devices. Explore, handle and organize fonts with the new Corel Font Manager to satisfy all your typeface needs. Manage your typeface and font collections with ease, and use fonts without having to install them. We've got you covered for every profession that uses fonts daily, from graphic design, publishing and illustration, to package design, sign making, advertising and website design. Save valuable design time with the enhanced font filtering feature. Quickly find the specific font you need without spending time searching in multiple folders. For example, if you're looking for a typeface that has a handwritten appearance, you can do a quick search for “script fonts.” The font list will automatically update to show all the fonts on your machine that match that search. You asked for it, and we listened! Take advantage of the new important design features that we created based on feedback from CorelDRAW users. Manage complex projects with ease by using the new Hide and Show Objects feature that lets you hide individual objects or groups of objects on a layer without hiding the entire layer. Explore the Gaussian Blur lens, featured within Corel PHOTO-PAINT, for non-destructive blur effects. Adjust the degree to which the drop shadow feathers at its edges in CorelDRAW so you can control the perceived distance and size of objects against the background and other elements. With the revamped Knife tool in CorelDRAW, split any object or group of objects ? vector, text and bitmaps – along straight, freehand or Bézier lines. Create a gap between the new objects resulting from the splitting action or overlap them. Choose an outline option, or let the application automatically select the option that best preserves the outline appearance. 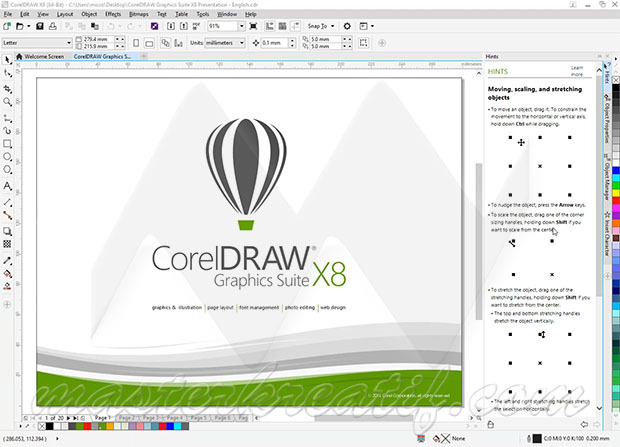 Whether you're a first-time user or an experienced designer, CorelDRAW Graphics Suite X8 makes it easy to get started. Learn the basics, see what's new with a Startup tour, or transition to the suite with a special tour designed just for Adobe users. Be productive immediately with a workspace that matches your workflow needs, and benefit from high-quality content and versatile in-product learning. All CorelDRAW X8 reviews, submitted ratings and written comments become the sole property of Windows 7 download. You acknowledge that you, not windows7download, are responsible for the contents of your submission. However, windows7download reserves the right to remove or refuse to post any submission for any reason. Windows 7 Download periodically updates pricing and software information of CorelDRAW X8 full version from the publisher, but some information may be out-of-date. You should confirm all information. Using warez version, crack, warez passwords, patches, serial numbers, registration codes, key generator, pirate key, keymaker or keygen for CorelDRAW X8 license key is illegal and prevent future development of CorelDRAW X8. Download links are directly from our mirrors or publisher's website, CorelDRAW X8 torrent or shared files from free file sharing and free upload services, including Rapidshare, MegaUpload, YouSendIt, SendSpace, DepositFiles, DivShare, HellShare, HotFile, FileServe or MediaFire, are not used.